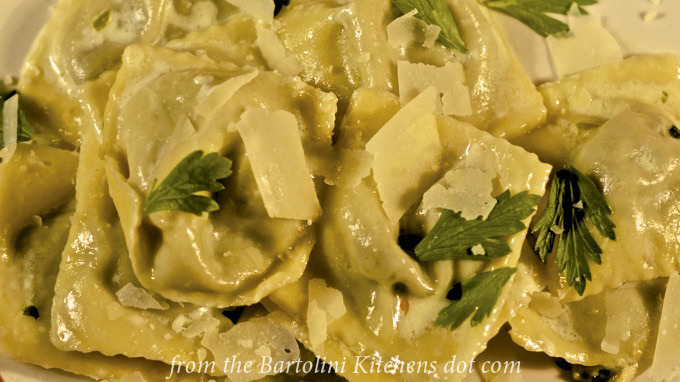 from the Bartolini kitchens | "Mangia e statti zitto!" Yes, I’m back! I hadn’t intended to be away nearly so long but there you have it. I realize that I posted the Greta introduction recently but this post needed to be published ASAP. In this part of the world, the tomato plants have reached peak production. There’s no better time to prepare Insalata Caprese, Panzanella Salad, and Pappa al Pomodoro, as well as today’s pasta, than right now. Surprisingly, this dish wasn’t served when I was a boy. With Grandpa’s garden easily meeting the tomato needs of both families, it’s a wonder that no one ever used a few of them to make this pasta. I can only say that I’m glad that I came upon the recipe a few years ago and have enjoyed it every August since. If you google Pasta al Pomodoro Crudo, you’ll find there are many recipes for the dish. In its purest form, all that’s required to prepare the sauce are ripe tomatoes, olive oil, garlic, basil, and salt & pepper, with pasta being the only cooked ingredient. Whether to use grated cheese when served is left up to the cook’s preferences. Some have added capers to the mix, and I myself have added anchovies. There are recipes that include onions that have been rinsed or lightly sautéed before being added to the pasta. Still more will lightly cook the tomatoes before adding the pasta. Of all the versions I’ve tried, the latter using slightly cooked tomatoes is the one I’ve avoided. For me, the taste of fresh tomatoes is what makes this dish so special. Cooking, no matter how slight, would ruin this for me. Nothing compares with the aroma of fresh tomatoes combined with basil and olive oil. When brought to the table, it’s practically intoxicating. Give it a try and I bet you’ll agree. Still not convinced? OK. What do you intend to do with all of those tomatoes you’ve been picking? This is such a simple recipe. Just be sure to use ripe tomatoes with fresh basil and garlic. This is not the time for canned/jarred/dried ingredients. Once assembled, let the sauce rest for about an hour before cooking the pasta. (See Notes.) Lastly, the ingredient amounts listed below are merely guidelines. you may wish to have more/less tomatoes in your pasta. The same is true for the basil. hand-torn basil leaves, more for garnish. In a large bowl, place the tomatoes, basil, garlic, anchovies (if using), and olive oil. Gently mix to combine. Cover and set aside. After about an hour, bring a large pot of salted water to the boil. Add the pasta and, following package directions, cook until al dente. Drain the pasta, reserving about a cup of the pasta water. Move to a serving platter and garnish with more torn basil and, if using, grated cheese and whole anchovies. You can use any tomatoes for this recipe just so long as they are ripe. I seed “regular” tomatoes but only halve cherry tomatoes when using. Use any type of pasta you prefer. I like tagliatelle but either penne or farfalle, for example, will work just as well. My use of anchovies started last year when I had some leftover from preparing pizza the night before. I’ve included the little fishies ever since. No need to use them if you don’t like them. I’ve never let the sauce sit for hours or overnight because I fear the tomatoes would lose too much of their structure. The firmer the tomato the better, in my book. If the final dish is too dry, you can also add a drizzle of olive oil with(out) the pasta water to moisten it. We knew summer was in full-swing when platters of Mom’s tomato antipasti appeared on the dinner table. Another easy dish to prepare, these are a wonderful way to serve ripe tomatoes without touching the stove — a blessing on many August days. You can learn how to prepare Mom’s dish HERE. It took nearly 3 months but I did find me a dog — or did she find me? Meet Greta Curbo, a hound-mountain cur mix that I adopted from the Orphans of the Storm Animal Shelter. A spirited two-year-old, Greta has brought some much-needed comic relief to my home. And to that, all I’ll add is that there’s a bit of Max in this one. Speaking of Max, I want to thank you all for your kind words and heartfelt expressions of sympathy. His death was quite sudden and within 36 hours I was aboard a flight heading to Rome. (My vacation post is in the works.) The timing of my holiday was in many ways heaven-sent, although my home was just as empty when I returned as it was when I had left. That’s not the case anymore, however. Greta may be less than half Max’s size but she has made her presence known from the moment she crossed the threshold. Like some rescues, Greta does have a few health issues. She was terribly thin — even emaciated — when rescued (see above photo) and I’ve fed her any and every thing she may want. If there’s anything I can do, it’s help with weight gain. (it’s a gift.) She’s gained 10 pounds and has another 5 to go. The rest of the issues are being addressed and some have already been eliminated. She returns to the vet at month-end and I’m sure she’ll get a clean bill of health. I’m looking forward to getting that approval because without it, Greta is pretty much quarantined. True, we do take daily walks but she is considered contagious and can’t come in contact with other dogs. She is highly spirited, however, and needs more exercise than these walks provide. Once she’s given the all clear, we’ll be hitting the dog parks, doggy day care, and eventually the dog beaches. Just like Max, the more exercise she gets, the more peaceful my home. Noticing Lucy for the first time. I may have happily welcomed Greta into my home but the same cannot be said of Lucy. She greatly disliked Max and it looks like she’s even less impressed with Greta. Whether in her large cage (above) or the smaller one in the living room, she will march up to the cage’s wall to face-off with the new-comer. For her part, Greta responds with barking and, much to her surprise, Lucy doesn’t give an inch. In fact, if Greta moves close to the cage, Lucy will charge and try to bite her snout, the barks being interrupted with the rapid-fire taps of Lucy’s beak against the cage’s bars. Kids! All facts considered, Greta’s adoption is going smoothly, although we are still learning about each other. Just last week for example, Greta learned that she’s a lap dog, something I learnt only moments later. Up until that time, I would sip my coffee every morning in my backyard on the famed Bartolini Cafe Patio. Since her epiphany, I now gulp my coffee, trying my best not to spill it as Greta tries to find the most comfortable spot on my lap. It’s apparently not as easy as I would think — or hope — and I’ve a number of coffee-stained shirts to prove it. Most of the photos here have been shared on Facebook and/or Instagram. Not all of you visit those sites, however, and I wanted to announce Greta’s adoption. As I’ve mentioned, my Italian vacation post is in the works and, as you’re about to see, I’ve the next recipe ready to post. This recipe has been a long time coming. In fact, this is actually the 4th rewrite. Each of the prior versions included time-sensitive references that no longer apply. (Let that be a lesson for us all.) Even this post is time-dependent, making me all the more determined to publish it post-haste — but more about that later. My wonderful cousin, Marinella, graciously shared her meatball recipe with me the last time I was in San Marino — two years ago! While sitting around Zia Pina’s kitchen table one evening, I recorded a number of recipes in a small notebook and stored it safely away — never to be seen again. Well, I did find a meatball ingredient list on a piece of paper in my luggage but nothing more. Why did I write this list and how did it, alone, get into a pocket of my luggage are 2 questions that will probably never be answered. “Wait a minute. ‘Luggage”? What was he doing with his luggage?” you might be asking. Well, I’ll be heading back to Italy in but a few days and San Marino will be among the places we’ll visit. There’s no way I’d go to Italy without paying my Zia and cousins a visit. This time my niece, “G”, will be joining me for her first trip abroad, as will her brother, “M”, who accompanied me 2 years ago. We’ve planned our stops so that they can spend their days touring while I relax on a terrace and watch the watery horizon, if I so choose. A good time is sure to be had by all. You may have looked upon the opening photo and wondered, “Where’s the spaghetti?” The fact is that the quintessential dish, spaghetti with meatballs, is not Italian in origin. The dish was actually created here in the States by Italian immigrants some time around 1900. Needless to say, the dish “caught on” and has become a staple of Italian restaurants — on this side of the Atlantic. Oh, sure, you may see “polpette” (Italian for meatballs) on menus in Italy but they will not be served with spaghetti. In fact, if you do see “spaghetti e polpette” on a menu, you’re probably in a place that is trying to attract American tourists. Another difference you may notice is their size. In Italy, polpette are about golf ball-sized. Here, meatballs can be over twice that size or, when served as appetizers, quite small No matter what size you choose to prepare, an ice cream scoop makes the process much easier. Finding that ingredient list resulted in the first of many contacts with my cousin, all of which were necessary. You see, left to my own devices, I ended up with a number of tasty meat sauces with nary a meatball between them. In each case, the meatballs disintegrated in the sauce. Once I learned the correct amounts for the ingredients, our discussions turned to her method of preparation. Below, I’ve detailed her methods, as well as my recipes for meatball appetizers and meatballs simmered in marinara sauce. The meatball recipe is actually quite simple. Grind/mince equal parts beef, veal, and mortadella (an Italian bologna-like product). Add a few tablespoons of chopped parsley, and season with salt & pepper to taste. Now add the ricotta. When I made today’s meatballs, I used 450 g (16 oz) of each meat. I used 150 g (5 oz) of freshly made and drained ricotta. (See Notes) To the mixture, add a splash of red wine and a slightly beaten egg. (See Notes.) Be careful when combining ingredients. Do not overwork the meat or the meatballs will be too dense. Pan fry a little of the meat mixture and taste for seasoning. Cover and refrigerate for a short while to allow the meat to set-up before proceeding. See Notes for tips on storage. Mini-meatballs, “polpettini“, in red wine reduction, garnished with crumbled fried sage leaves. These meatballs are not heavily spiced, relying upon mortadella to deliver fantastic flavors. As such, care should be taken lest their flavor be lost in the preparation. This is especially true if serving them as appetizers with a wine reduction. After some experimentation, I found it best to bake the meatballs separately — (350˚ F, 175˚ C, for 20 minutes) — before adding them to the sauce just prior to serving. That will ensure that you taste both the meatballs and the sauce, with neither hogging the spotlight. Whether you call it a meatball sammich or uno panino con le polpette, something magical happens when meatballs meet marinara sauce and bread. If you ask me this sammich is the main reason for making meatballs but, as you know, I’ve a soft spot for sammiches. First, start by creating a marinara sauce, Here I make a sauce that’s even less complicated than the one I shared HERE. Chop an onion and sauté in olive oil, over medium heat, until soft. Add sliced mushrooms, if using. Once the mushrooms have softened, add 2 cloves of minced or grated garlic. When you can smell the garlic (about 90 seconds), add 2 tbsp tomato paste. Cook for about 3 minute before adding about 4 ounces of red wine or 3 ounces of balsamic vinegar. Your choice. Continue to simmer until most of the liquid — and all the alcohol — has evaporated. Add 2 large (28 oz) cans of diced tomatoes. Season with salt, pepper, and marjoram, to taste. Stir thoroughly. Bring to a boil before lowering to a soft simmer. After 30 minutes, give the sauce a good stir before carefully adding the meatballs. Do not stir the pot again for at least 20 minutes more. Stirring before the meatballs have a chance to set-up a bit may cause them to break apart. Continue simmering the sauce, carefully stirring occasionally, for another 45 minutes. Taste and season with salt and pepper, as required. Now, turn your attention to the bread. I prefer a roll with a not-too-hard crust but the choice is all yours. Slice each roll lengthwise and remove some of the bread from both top and bottom. This will help keep the meatballs from falling and rolling “off of the table and on to the floor …” Spoon a bit of sauce into the trough you’ve just created and, with a slotted spoon, add as many meatballs to the bun as will comfortably fit. Place a slice or two of cheese — provolone, mozzarella, asiago, etc., — atop the meatballs before adding a garnish of fresh basil leaves. Buon appetito! You really didn’t think I could look upon a pot of sauce with meatballs in my fridge and not whip up a dish of spaghetti with meatballs, did you? In fact, I found the sight so moving that I pulled out the pasta machine and made the spaghetti, too. I prepare my own ricotta for use in this recipe. You can see how easy it is to prepare HERE. Use caution when using smaller amounts of meat for the meatballs. I learned, the hard way, that too much liquid will cause the meatballs to crumble during cooking. A delicious tomato sauce resulted but that’s not quite what I had in mind. You can use white or red wine for your wine reduction sauce. You can also add whatever herbs you prefer. If added early on you’ll derive more flavor from them, especially given that the sauce is being reduced. It’s for that reason, I prefer to add them at the end, to be briefly simmered before the sauce is strained. The meatballs can be refrigerated, covered, for a short period, although it’s never safe to keep ground/minced meat in the fridge for long. Frozen, they will keep for weeks. Whether I cook them before freezing depends upon how I intend to use them. If making appetizers, I’ll bake the meatballs before freezing. If using them in tomato sauce, I’ll freeze the meatballs raw, to be thawed before being placed into the sauce. Both the sauce and meatballs will benefit being simmered together. How you serve the meatballs will determine how much tomato will be needed. Less will be needed for sandwiches, for example, than is required for to create a marinara sauce. As of this rewrite, we are coming out of what is hopefully winter’s last stand. So, before saying farewell to comfort food for the season, let’s take a look at the short rib recipe I posted way back in March, 2012. The recipe was very well-received and it remains a personal favorite. I’m currently looking into modifying the recipe to utilize a pressure cooker. If all goes well, I’ll either write a new post or update the old. In the meantime, you can check out the original recipe HERE. I know. I know. I was supposed to share my cousin’s meatball recipe and I had every intention of doing so — and then I looked at the calendar. Forgive me, Giuseppe, but I forgot your feast day. For those not familiar, some believe that St. Joseph’s intervention brought drought relief to Sicily during the Middle Ages, thus preventing widespread famine. In appreciation, the faithful vowed to prepare a large banquet in his honor and to forever commemorate his Feast Day. Over the years, St. Joseph was named the Patron Saint of towns and villages throughout Sicily and the Italian peninsula, and his Feast Day became Fathers Day in Italy.Today, March 19th, is cause for celebration with parades on both sides of the Atlantic That feast has evolved into the current day St. Joseph’s Table tradition in which the faithful bring a variety of foods and sweets to their parish churches. This is one potluck you don’t want to miss! Any money collected during the celebrations is donated to the area’s needy. Still interested? Here’s a more thorough description of the St. Joseph’s Table. I’m sure you will understand if I postpone the meatball post one last time. After all, I’ve a virtual platter to prepare! You can’t have a proper celebration without music. As one of the many kids attending any number of weddings, we all sat mesmerized as our parents circled the dance floor again and again, each pass a little faster, as this music’s tempo increased. Chicken dance? Ha! Hope your toes are in tapping condition. Now, I must admit to initially drawing a blank when I attempted to think of recipes worthy of this illustrious Saint. 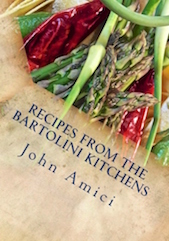 The Bartolini recipe file is pretty much depleted of all dishes once served on festive occasions. What to do? What to do? And then, an epiphany! (Considering the Saint, an epiphany sounds about right.) A number of years ago, my good friend, formerly known as my “Traveling Companion”, attended a family gathering and today’s dish, Cannoli Cream and Chips, was served. I could not believe my ears as he described the dish. Why hadn’t I thought of this? Not very much later, I was invited to join him when he next visited his family. Before going further, let me talk about that family. When I first visited, walking over the threshold was like walking back in Time to the Bartolini family gatherings in the old two-flat. A welcoming cocktail and friendly conversation to be followed by a wonderful dinner with, of course, a platter of pasta the table centerpiece. His family welcomed me as one of their own and that evening remains a very special memory for me. A few months after he described the wondrous confection, I was again invited to join him when he visited these good people. It was warmer this visit and we all gathered in what I believe was the sunroom. There, in the center of the table, was what I now consider the Holy Grail of Nibbles: a bowl of cannoli cream surrounded by chips made from broken cannoli tubes. Yes, you read that correctly, cannoli cream and chips!!!! In my mind, “chips and dip” would never mean the same thing again. Since that fateful day, I’ve learned that our dear hostess found this wonderful appetizer at one of the area’s groceries. Once I heard that, I went shopping and, yes, I, too, found them. In fact, they can be found in this store’s pastry department for just about any holiday. To be honest, I’ve never bought them. Where’s the fun in that? I’ve got time and a Kitchen Aid stand mixer. Let me at it! I’m about to share recipes for both the cannoli cream and the chips. Truth be told, recipes aren’t the focus of this posting. It’s the way they’re served. So, if you’ve a favorite cannoli cream recipe, by all means use it. The same is true for the tubes. This post is about serving an old favorite in a new way. Whip the cream until stiff peaks form. Set aside. In another bowl, whisk the ricotta until smooth. Slowly add the sugar while continuing to whisk. Add the vanilla and cinnamon and whisk until well blended. Add the chocolate and carefully stir. Gently fold the whipped cream into the ricotta mixture. Cover and refrigerate for at least 1 hour before serving. Cannoli cream should be kept refrigerated and used within 2 days. Sift together the flour, sugar, and salt. Add the pieces of butter and combine with the flour using your hands until the mixture resembles gravel. It’s not too late to change your mind and buy some cannoli shells. Add the wine, a teaspoon at a time, and knead to create the dough. Once a smooth dough is achieved, flatten it, wrap in plastic and refrigerate for no less than 15 minutes. Use a pastry cutter to cut the dough into chip-sized pieces. Place oil for frying into a frypan to about a depth of 1/2 inch (1.25 cm). Use a slotted spoon to remove the chips and drain on paper towels. Cooled chips should be stored in an airtight container where they will keep for about one week. To serve, place on a platter within reach of the cannoli cream, and sprinkle with powdered sugar, if desired. This is the time to make your own ricotta. It’s easy to do and the reward is a cheese that is far superior to any that you might find at your local grocery. Click HERE to see how I make my ricotta. If you like, citrus zest and/or chopped candied fruit can be added to the cream for Sicilian-style cannoli cream. For chocolate cannoli cream, add 3 to 4 teaspoons unsweetened cocoa powder to the ricotta in place of, or in addition to, the cinnamon. If you are rolling pin-challenged like I am, grab your pasta machine and let the machine do the work for you. A warning for all March Madness fans. Do not attempt to fry these chips when a local underdog (Loyola) makes its first appearance at the Big Dance in over 30 years. Worse, if the team is tied going into the closing minutes, turn off the stove and go watch the game. Well, a picture really is worth a thousand words. ETA: Loyola played again on Saturday night and won!!! They now advance to the next round, the Sweet 16, and will play again on Thursday. Go Ramblers! This is a holiday so why not take another look at one of the Bartolini all-time favorite dishes, Zia’s Baked Calamari?. It’s a family classic and one that’s sure to bring a smile to any Bartolini whenever it’s mentioned. You can read all about it HERE. As you can see, there’s been a change in programing. I had planned to share my cousin’s meatball recipe but the return of winter sent me back to Comfort Food Land. While I was preparing today’s dish for my dinner, I realized that I could just as easily share its recipe. So, I pulled out the camera, snapped a few photos, and wrote the post. (Then I spent the next 4 days editing but never mind that.) Perhaps some of you may find the recipe useful in the weeks ahead, while others in the winter yet to come. If you follow me on Instagram, you may have noticed that judging by the photo trail, I’ve grown quite fond of pho, ramen, and hot-pots. Throughout much of fall and all of this past winter, when out-and-about on a chilly/frigid day, I was likely to stop for lunch at any one of a number of nearby restaurants specializing in these delicious bowls of comfort. It wasn’t long before I began to wonder whether I could prepare any of them here at home. Discovering an Asian super-mart only fueled my curiosity. One afternoon, while searching Vietnamese cookbook summaries, I came upon “The Pho Cookbook: Easy to Adventurous Recipes for Vietnam’s Favorite Soup and Noodles.” Written by Andrea Nguyen, it has become my go-to reference book whenever I need information about my newfound loves. Ms. Nguyen offers a wealth of information to go along with her great recipes. Believe me. This neophyte Asian cook can use all the help that I can get. Virtually every aspect of the cooking process and ingredient list is explained. Not only will you learn the secrets to pho preparation but she also shares methods for preparing a number of the sauces common to Asian cooking. Not to worry. She also gives suggestions for the commercially produced versions. If you’ve ever stood before an Asian market’s soy or fish sauce-filled shelves, you’ll realize the value of these suggestions. Aside from the wealth of information presented, Ms. Nguyen offers more than 1 method for preparing some dishes, If you’ve time, follow the standard method. In a rush? Pull out the pressure cooker. Still too long? She offers quick recipes for beef, chicken, and vegetarian pho that you can easily prepare in well under an hour. Today’s recipe is one of these. In future posts, I’ll share her recipes for chicken and beef broths. We’re talking “quick” here, however, and those broths will have to wait their turn. One other point to make concerns the beef. Ms. Nguyen suggests using cooked roast beef or steak, very thinly sliced. If you like, in this recipe you can substitute thinly sliced roast beef that can be purchased at any deli counter. There’s even a third option. If like me, you live near a Korean market or well-stocked Asian market, you might find thinly sliced cuts of beef and pork. For today’s recipe, I used sliced rib eye steak, although I have used sliced beef brisket, as well. 3/4 inch (2cm) ginger, peeled and cut into slices. Bring the sliced beef to room temperature. Use the broad side of a knife to pound flat the sliced ginger. Trim off the green of the spring onions. Roughly chop the white portions and smash using the broadside of a knife. Thinly slice the green part and reserve for use as a garnish. In a medium-sized sauce pan, toast the star anise, cinnamon, and cloves over medium heat until fragrant — about a minute or so. Add the ginger and onion to the pot and stir until fragrant — about 30 seconds. Remove pot from heat. Briefly cool before adding the beef & chicken stocks, the water, and salt, Stir well and bring to a boil over med-high neat. Lower the heat and softly simmer, uncovered, for 30 minutes. Once finished simmering, pour the broth through a fine mesh strainer over a bowl. For especially clear broth, use a piece of muslin to cover the strainer. You should have about 2 quarts (2 liters) of broth in the bowl. Discard the strained solids. Add the fish sauce and taste the broth. Add the sugar/maple syrup, to taste. Reheat the broth, place the noodle-filled strainer (see Notes) into the hot broth, and leave until heated through — no more than 1 minute. Split the noodles between the 2 bowls. Add the sliced meat to each bowl in a single layer. To ensure even cooking, avoid “stacking” the pieces. .
Garnish with the reserved sliced onion greens, chopped cilantro, and black pepper. Ladle the now-steaming broth into each bowl and serve. This is not the time to economize when buying the stocks. Be sure to choose your favorite stocks upon which to build the pho. If doubling or tripling the stock recipe, freeze the excess for later use. Once thawed, you can prepare a bowl of beef pho in about the time it takes to prepare the noodles. This is why I always have a quart of this stock on-hand. If you’re using thinly sliced, raw beef and you prefer your meat cooked well-done, you will probably want to pound the slices even thinner. This will ensure that the steaming broth cooks the meat to your liking. No matter whether you choose to pound the slices, trim off the fat and slice them into bite-sized piece before adding to each bowl. Not only will the beef be more appetizing but it will be far easier to use chopsticks when dining. The garnishes listed are those indicated by Ms. Nguyen, although she encourages one to add whatever one prefers. I’ve grown accustomed to adding cilantro leaves, Thai basil, culantro, sliced jalapeño, bean sprouts, and a squeeze of fresh lime. Some chefs are insulted when a patron adds sauce(s) to their pho. Placing the sauces in a small bowl allows one to dip the cooked meat(s) into the sauces, leaving the pho/ramen just as the chef intended, Here I’ve combined Hoisin and Sriracha sauces. Hard to believe that it was 3 years ago when I shared an agnolotti recipe, the filling for which was prepared following the family recipe of a sous chef at a restaurant in Bologna. There’s a reason why my mind has drifted back to Italy but more about that in a later post. 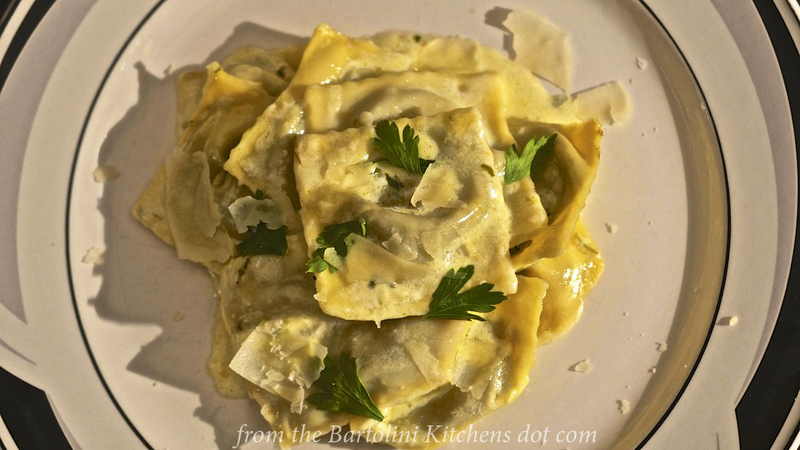 For now, if you want to see how these agnolotti were prepared, just click HERE. OK. By now you may have noticed that this blog has taken a turn into decidedly comfort food territory. I could give a number of reasons for this change of course but one rises above all others. Baby, it’s cold outside!!! Even worse, we’ve just endured a 9 day period where it snowed each and every one of those day! Is there any wonder why there’s Pork Belly Ramen slowly simmering in my slow cooker as this post is being written? I was first served this wonderful ramen on my way home after a visit to the Garfield Park Conservatory late last winter. I stopped at a restaurant, Urban Belly, and ordered the Pork Belly Ramen based upon recommendations of previous diners. Bless them! Once home, I immediately googled “pork belly ramen” and started comparing recipes. Off the top, I wanted to use my slow-cooker, rejecting the recipes that didn’t. Hopefully, slow-cooking would not only result in tender pork but the broth should benefit, as well. With luck, the finished dish would include a soft-boiled egg. No matter. That egg was such a nice addition to the Urban Belly ramen that I was going to add it to whatever recipe I eventually chose. Within minutes, I found the recipe that’s shared here. Of course, being the conscientious blogger that I am, I would never post a recipe without rigorous testing. So, I prepared the recipe again and again… and again … and again … and, well, you get the idea. Needless to say, the recipe not only passed the tests but has become a regular guest at my winter-time dinner table. I buy the pork belly, divvy it up into 1 pound pieces, use one for that night’s dinner, and freeze the rest. In fact, right now I’ve 2 pieces of pork belly resting comfortably in the freezer. Let it snow, let it snow, let it snow. Aside from adding a couple garnishes, the only change I made to the recipe is in the handling of the pork belly.The recipe indicated that the belly should be cooked with the skin attached, to be removed just prior to slicing. The meat isn’t seared. When I tried it that way, I had a devil of a time removing the skin without (badly) butchering the belly. I even tried slicing the belly first before removing the skin. And the fat? Without any type of sear, it was a bit of a disappointment. For me, one of the most appealing things about well-cooked pork belly is the crispy fat. Believe me, it’s well worth the time (5 minutes) time and effort (minimal) to place that belly into a hot frypan and sear its fat side. Just be sure the pan is hot. You want to sear the fat quickly without further cooking the meat. Once sliced, place the slices on top of the ramen, keeping the seared side above the broth to maintain its crispness. Note: Because this recipe endured such thorough testing, the link was never saved (to be later lost) but printed instead to allow easy access. So, unlike recent posts, it gives me great pleasure to give credit where due. This recipe can be found on the Australian Good Food website. Add the chicken stock, tamari, sake, mirin, sugar, and miso to the slow-cooler and stir thoroughly. To the pot, add the leek, ginger, garlic, and carrot. Stir. Place the kombu into the pot before adding the pork belly. Cover and set the cooker to “LOW” and the timer to 7 hours. Cook the noodles per package directions. Meanwhile, pour the broth through a fine-mesh strainer. Return to the slow cooker and keep warm. Divide the cooked noodles evenly among the serving bowls. Add equal amounts of the strained broth to each bowl. Slice the egg, if using, and add to each bowl. Place the sliced pork belly into each bowl. To maintain its crispness, try to keep the seared edge above the broth. The remaining garnish may be added now or brought to the table to be added by your dinner mates. Don’t be overly concerned when chopping the vegetables. Once the pork is cooked, the broth will be strained and the vegetables discarded. I’ve a smaller-sized slow cooker and, therefore, use a small piece of pork belly. This recipe results in 4 bowls of ramen, each with 2 slices of pork belly. Kombu is dried kelp and can be found in the Japanese section of many Asian markets. It is purchased in sheets and should be lightly wiped with a damp cloth before use. Store in an airtight container. Similarly, nori — used here as a garnish — is dried seaweed also purchased in sheets. It’s very often used to wrap sushi rolls, maki. You, or your guests, may wish to place a small sheet into each bowl to add some texture and crunch to your ramen. Although “ramen” noodles can be purchased at many groceries, feel free to use whatever noodle — rice, bean, egg — you prefer. Just keep an eye on the clock to insure that they are ready when you’re filling the bowls. Badly cooked noodles will spoil any dish, no matter the country of origin. You needn’t sear the pork belly, if that’s your preference. Whether you do, be sure to slice the meat so that it can be evenly divided among the serving bowls. Remember: always slice the meat against the grain. You may have noticed the small bowl to the right of the ramen in the opening photo. It contains sriracha and hoisin sauces. I got the idea of combining both by observing patrons at a number of pho restaurants. Additionally, one of this area’s food critics — more about him in a future pho post — mentioned that some chefs are insulted when a patron adds sauce(s) to their pho. Placing the sauces in a small bowl allows one to dip the cooked meat(s) into the sauces, leaving the pho/ramen just as the chef intended, thereby averting an International incident. Here we stand, feet firmly planted in comfort food country, and here we shall stay. Today’s look back was — and still is — a great recipe for these wintry days. Easy to prepare and oh, so very hearty, you won’t care what’s happening outside your door with a bowl of this lentil soup before you. The recipe for this lentil dish can be found HERE.